Following World War I, the depressed civilian aviation market created a real challenge for aircraft and engine manufacturers. Hundreds of surplus military airplanes and engines flooded the civilian airplane market at the end of the war. To offset the situation, the Curtiss Aeroplane and Motor Company created the Hawk series. It was a private venture to secure military contracts, however the US Army had no immediate requirements for a new fighter and military contracts were hard to come by as well. 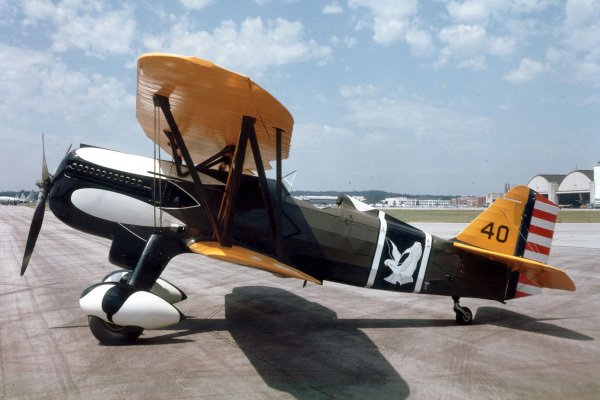 Beginning in 1922, Curtiss began design on the Curtiss Hawk line and small deliveries followed in 1923. There were many variations of the Hawk up to 1938 and they were produced in two categories, Pursuits and Advanced Trainers. Curtiss's plan was to create a demand by the virtue of the Hawk's superiority with the introduction of new structural concepts and with the introduction of the 435 hp Curtiss D-12 engine. After demonstrating the Hawk Model 33 to the US Army Air Service (USAAS), they were impressed enough to buy the prototype and order two additional aircraft. (In July 1926, the Army Air Service became the Army Air Corps. )2 When initial trials were completed, the Model 33 went into production for an order of twenty-five. The aircraft was designated PW-8 by the USAAS for Pursuit, Water-cooled, Model 8. The US Navy designation was the F6C-1 which took deliveries in 1925. Although the wings were still made of wood, updated changes in traditional production methods introduced the wire braced welded steel tube airframe, a split undercarriage, and aluminum framed tail surfaces. Armament on the Hawk was the traditional US standard of either two .30 caliber machine guns or a combination of one .30 caliber machine gun with one .50 caliber machine gun synchronized to fire through the propeller. The production of the P-1 series differed from the original PW-8 with the introduction of a tapered wing. The first P-1 was fitted with an experimental inverted Allison air-cooled version of the Liberty engine. The P-1 later became the XP-17 with the installation of Wright V-1740 inverted V-12 air-cooled engine in June 1930. Provisions were also made on the P-1 series for an alternative installation of the larger 500 hp Curtiss V-1400 engine and these were designated as the P-2. The P-6 series (Model 34 & 35) were essentially P-1C airframes with the installation of the new Curtiss Conqueror 600 hp V-1570 engine. The V-1570 was a subsequent development of the Curtiss D-12 engine via the V-1400 engine. The most famous of the Hawk line was the 1931 P-6E which was delivered with an updated Curtiss Conqueror 700 hp V-1570 engine of which 46 were produced. P-6Es rapidly became obsolete and instead of being refurbished, they were allowed to wear out in service of which one remained in service up to 1942. Total production of the Hawk series was 717 aircraft. 278 were produced for the US Army, 132 for the US Navy and 307 as demonstrator and export models. Export of the Hawk began in 1926 and continued until 1938. An additional eight aircraft were built by Aviolanda in the Netherlands. Although it was never used in combat, the P-6E is recognized as one of the most aesthetically pleasing aircraft of the 1930s. One Curtiss V-1570C Conqueror liquid-cooled, 700 hp (522 kW), V12 engine. Two Browning .30 in (7.62 mm) machine guns. 1. Peter M. Bowers. Curtiss Aircraft, 1907 - 1947. Annapolis, Maryland; Naval Institute Press, 1987. 245. 2. Murray Rubenstein & Richard M. Goldman. To Join with the Eagles. . Garden City, New York: Doubleday & Company, Inc., 1974. 39. Created November 15, 2009. Updated December 22, 2013.